Many people rate Roosevelt the greatest leader of the 20th Century. What made him so great. There are many answers to this questions but let me tell you about just one of them. In Michael Fullilove’s great book, Rendezvous With Destiny, he tells the story how Roosevelt thought out of the box in order to gain the quality of knowledge he required to take the best decisions. In 1940 with the fall of France, Roosevelt knew that the survival of Western Civilization was at stake. He needed to know first hand the true situation of Britain left as they were, to fight the Axis powers alone. Could they survive? What was the leadership like? What did they need? What could Roosevelt do. Public opinion in United States was still against entering the war, so Roosevelt had to find a way to help Britain and to edge the United States slowly towards direct involvement in the war. Roosevelt didn’t trust his ambassadors or the State Department to get him the information he needed, so he took the very unorthodox route of sending personal envoys in order to get a first hand picture of the situation and to build the relationship with Churchill. He used a personal friend, a businessman, a first world war hero and a political rival to do the job. This drove the State Department and his ambassadors crazy, but Roosevelt did what he had to do to get the results he needed. These envoys never had official titles, and the press never knew the exact nature of their mission, but they got the information Roosevelt needed, helped him build a trusting relationship with Churchill and assisted in getting the Lend Lease legislation through Congress and manage the logistics of getting the material to the British and indeed later on to the Russians. The Germans may never have been turned back without this assistance. I have worked with many CEO’s and hundreds of members of Senior Management Teams. Their main problem is that they never get feedback on their own behaviour, are often not capable of communicating their thoughts to the rank and file and often don’t really know what is really happening in the day to day management of their companies. They are also often unaware of what their people think. These senior managers often depend on Human Resources to help them learn all of the above, but the problem is that Human Resources, just like Roosevelt’s State Department back in 1940, have their own agenda and their own problems and therefore are not always the best channel for getting the senior managers the information they need. 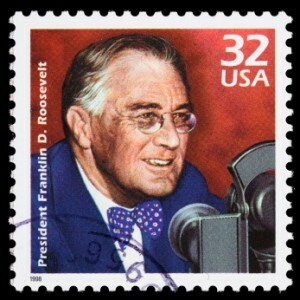 Think like Roosevelt to get the information you need. Be cautious with who you tell about what you are doing. Leaders need to know what’s going on, they need to build the relationships that will help them get their business strategy executed and, they need to be creative in the way they do this. Roosevelt and his envoys helped save western civilization. What could you achieve with the right information?